Through the upcoming months you will hear the stories of women and their business – their decision to become a business owner, what building blocks supported them, and what inspiration and motivation kept them going and GROWING. Powered by Women Entrepreneurs, this new WE series will celebrate and spotlight accomplished women entrepreneurs. We will share the stories of those who have succeeded by knowing they couldn’t do it alone and surrounded themselves with expert advisors. The WE series: Inspiring passion and spotlighting success. Brought to you by OneGroup, The Wise Women’s Business Center, and 93Q. 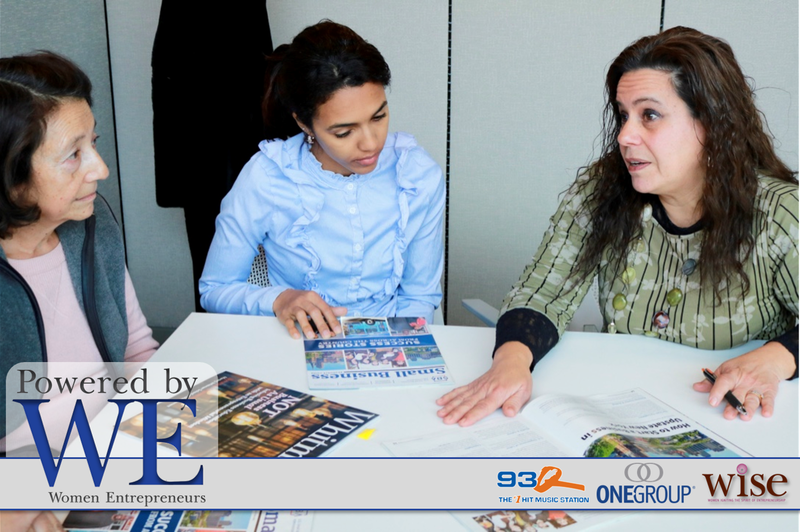 President of Brophy Services, Inc.
December’s featured interview, powered by the WE series, is with Jaime Venditti and Julie Miner of J Strategies Inc.
November’s featured interview, powered by the WE series, is with Marisol Hernandez and Kathy Adams, instructors of WISE’s “Excito! Accelerator” program. August’s featured interview, powered by the WE series, is with Christin Chandler, owner of Christin Chandler Designs. May’s featured interview, powered by the WE series, is with Clara Lawrence, Managing Partner of SaferStays.com which specializes in helping college students find safer housing and rentals. April’s featured interview, powered by the WE series, is with Clara N. Cedeño owner of La Patria Café opening in the Hawley Green neighborhood in August! Pictured in the photo (from left) : Rina Corigliano-Hart of ONEGROUP, Agi and Amy. February’s featured interview, powered by the WE series, is with Joanne Lenweaver, Executive Director of the Wise Women’s Business Center, and Barbara McQueeney, President of Allied Electric, a certified woman owned business. January’s featured interview, powered by the WE series, is with Joanne Lenweaver, Executive Director of the WISE Women’s Business Center and female entrepreneur Debbie Titus, owner of Half Moon Bakery and Bistro in Jamesville. December’s featured interview, powered by the WE Series, is with Joanne Lenweaver, Executive Director of the WISE Women’s Business Center and female entrepreneur is Joan Sardino, owner of Serving Seniors. November’s featured interview, powered by the WE series, is with Nikki Polos, owner of Aspen Athletic, who started the company in 2004 and it’s 100% woman owned! The CNY native has grown her company from one location with four employees to four locations with over 160 employees! Pictured: Nancy Muserlian, owner of Owera Vineyards in Cazenovia.